Should I Buy Netflix Stock? Subject: Should I Buy Netflix Stock? × 5 = 20 Required Please enter the correct value. 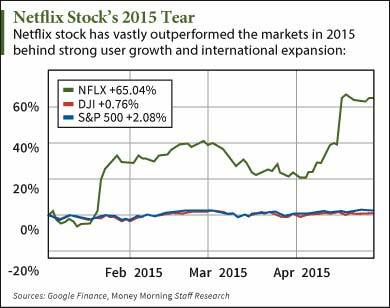 Netflix Inc. (Nasdaq: NFLX) has been one of the biggest winners of 2015, having gained more than 65% year to date. That compares to a gain of just 0.8% for the Dow Jones and 2.1% for the S&P 500 during the same time. Now, shares are priced over $565 per share. They hit an all-time high of $576.13 after reporting Q1 earnings in mid-April. And that has many investors asking us the same question: "Should I buy Netflix stock?" On April 15, Netflix reported earnings per share (EPS) of just $0.38 for Q1. Estimates had called for EPS of $0.69. Revenue was in line with expectations at $1.57 billion for the quarter. But NFLX stock still soared more than 17% the following day. The first reason investors looked past dismal earnings numbers was the firm's strong user growth. Netflix's global user total reached 62.3 million in Q1. The company's goal had been 60 million. In the first quarter alone Netflix added 4.9 million new members. Of those additions, 2.6 million were international compared to the company's forecast of 2.25 million. Netflix has been working to grow its international user base and this quarter's performance was a huge success. Netflix is now available in over 50 countries. The third reason the stock has soared is the company's focus on original programming. The third season of "House of Cards" as well as new shows "Unbreakable Kimmy Schmidt" and "Bloodline" were highly touted by the company in Q1. I was once subscribed to Netflix and ended it up disappointed. I've been expecting too much. My subscription was a waste of money, you know. It wasn't worth it at all. Spamming us with foolish movies? what the heck. Now, I'm using that thing called VPN. I've been subscribed to my VPN provider IronSocket for several months now and I use them to unblock Netflix and I get to stream their movies online freely. have we not been saying the same thing when NFLX was $400, $46,$500, $550, $600, $680. The above thesis could have kept you out of the ticker and leaving some 300 points at the table. You can buy it until the run up to earrings and sell your position on 7/21/2015 at 4:30 p.m. or so!